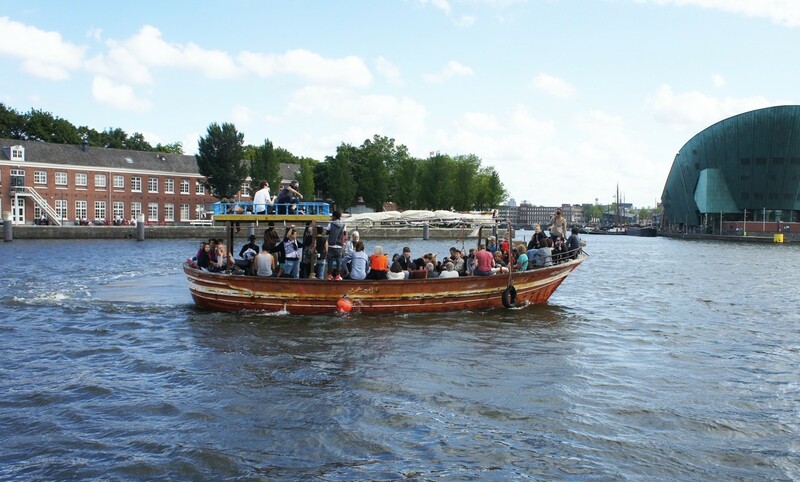 Rederij Lampedusa organizes joyful cruises in and around Amsterdam. The aim of the project is to show the potential of (im)migration, with a fantastic team of former refugees and a fleet of two former refugee boats from Italy we rock the canals of Amsterdam and beyond. Taking a ride with the company means plopping down on cushions - there are no benches - and listening to for example Syrian captain Mohammed al-Masri, along with others, tell not only their personal stories, but also those of the city dubbed the Venice of the north. Comfortably seating 12 passengers, when the Hèdir travelled to the Italian island of Lampedusa, it held 76 people on board. The fleet’s bigger sister, the Meneer Vrijdag , carried 282 people at 12-by-four metres. The two restored wooden crafts made their debut during Amsterdam’s 2015 Sail Festival, when some of the world’s most glitzy and eye-catching boats are on display. "Marechaussee entert 'vluchtelingenschip' op weg naar Oerol"
"A reminder to the city of its debt to immigrants." "We varen in de zon. Het is gezellig en je hoort nog eens wat."